Medium: Sumi-ink on paper, paper mat. In 2002, she published a collection of works entitled “Scene of Sumi” containing works that are abstract representations using sumi. The subjects are apparently natural landscapes, which she calls “all scenes of sumi”. Because the climate at the time of production has a significant impact on the conditions of sumi, water and paper, the works are also characterized as being “collaborations with nature”. The contingency of the blurring of sumi in the process of moving the brush is an inevitable process that can be used to express “something” that emanates there. Meanwhile, the cutting and layout of the mats on the panels are elaborately calculated, which contributes to an established style of expression that is both simple and original. Reiko Tsunashima, who graduated from Musashino College of Art and Design, learned calligraphy as a member of Toyo Shogeiin and then went independent. Since 2001, when she presented her works at an art fair in Belgium, she has been releasing works at various art fairs held in New York, Milan, Switzerland, Shanghai, Buenos Aires, Madrid, Singapore and other places and these efforts have met a very favorable response. In 2002, she published a collection of works entitled “Scene of Sumi” containing works that are abstract representations using sumi. 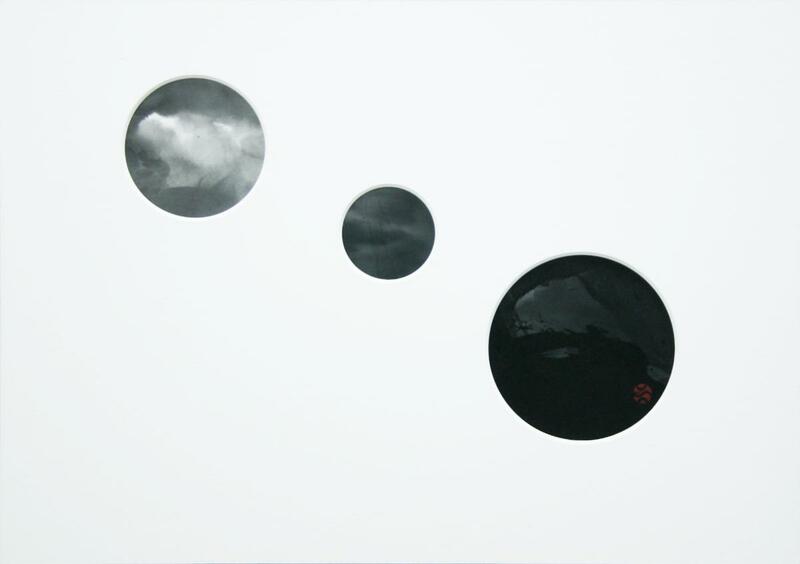 The subjects are apparently natural landscapes, which she calls “all scenes of sumi”. Because the climate at the time of production has a significant impact on the conditions of sumi, water and paper, the works are also characterized as being “collaborations with nature”. The contingency of the blurring of sumi in the process of moving the brush is an inevitable process that can be used to express “something” that emanates there. Meanwhile, the cutting and layout of the mats on the panels are elaborately calculated, which contributes to an established style of expression that is both simple and original.